Arrive Bhadrapur/Bagdora Airport and transfer to Darjeeling (2130 meters). A charming 5/6 hours journey through the Tea Gardens and tiny villages takes us to Darjeeling. Day 01: Arrive Bhadrapur/Bagdora Airport and transfer to Darjeeling (2130 meters). A charming 5/6 hours journey through the Tea Gardens and tiny villages takes us to Darjeeling. Built on top of a ridge, it faces the Himalayas and is a popular destination for the domestic and overseas tourists. O/N Hotel. Day 02: Early morning trip to Tiger Hill to see the sunrise over Mt. Kanchendzonga, the third highest summit in the world. Afterwards we visit the famous Ghoom Monastery which enshrines an image of the Maitreya Buddha (the Coming Buddha). Later on we can step in the Himalayan Mountaineering Institute, Zoological Park, and Tibetan Refugee Self Help Centre and visit the nearest tea plantation. In the evening, stroll around The Mall or souvenir shopping. O/N Hotel. 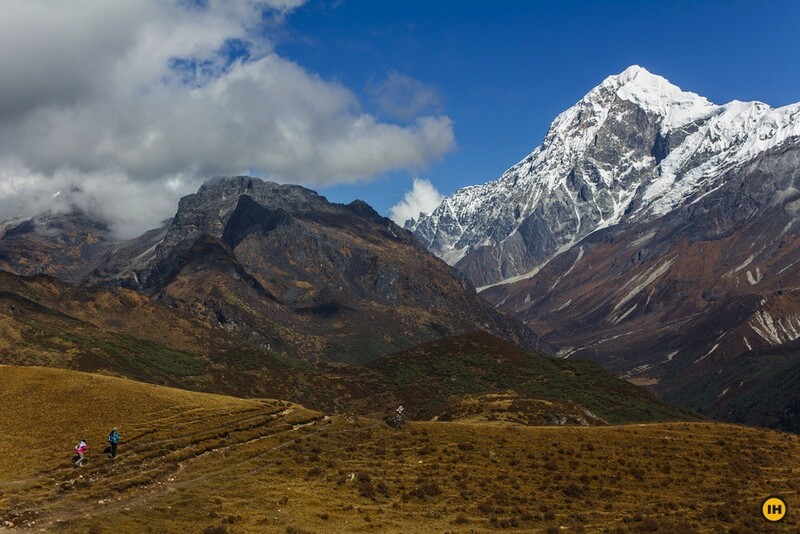 Day 04: Trek from Yuksom-Tshoka (3030 meters) in 6 hrs. The trail runs up the Rathang valley, through thick semi-tropical forests. Afterwards a steep climb takes us to the tiny Tibetan village of Tshoka. The landscape has now changed into alpine, rhododendron and magnolia forests. We get excellent vistas towards the whole Himalayan range and Mt. Kanchendzonga. O/N Tent or trekker’s hut. Day 05: Trek from Tshoka – Dzongri (4020 meters) in 5 hrs. A steep trail zigzags up through temperate forests and large stands of rhododendrons, to the vast clearing of Phedang. During April and May (perhaps the best trekking season), the spectacle is gorgeous, as the land becomes a mass of flowers (400 species have been listed so far). After 3000 meters, we follow the ridge line to Dzongri, a pasture area for Yuksom yaks from April to October. O/N tent or trekker’s hut. 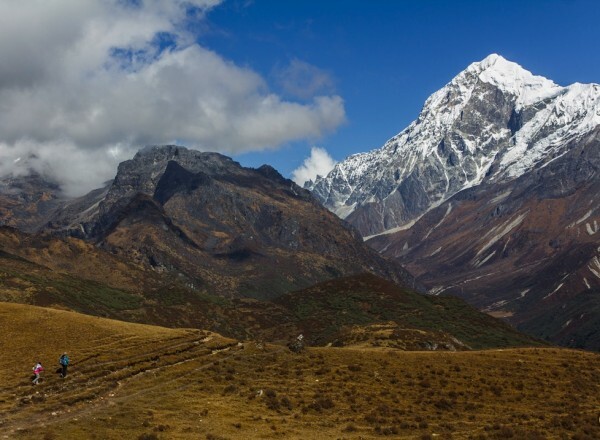 Day 06: Acclimatizing: According to the fitness of the group, we could head northwest to the Dzongri, where the panorama is stunning over Rathong glacier and far out, towards the Nepal’s border summits. We can also organize a shorter ascent towards Dzongri peak (4320 meters) and enjoy a great vista of the Kanchendzonga (8586 meters), the third highest summit in the world. O/N tent or trekker’s hut. Day 07: Dzongri – Thansing (3930 meters) in 4 hrs. We descend through rhododendron forest towards the banks of the glacial Perk Chu River. We establish our campsite on Thansing grassy pastures. 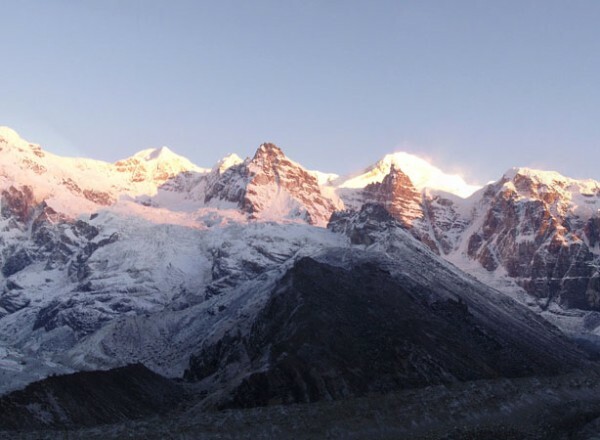 The southern ridge of Kanchendzonga and the Onglakhang glacier are visible directly ahead and there are close up views of Mt. Pandim to its grandeur. O/N tent or trekker’s hut. Day 08: Thansing – Samity Lake (4200 meters) in 3 hrs. A pleasant walk beneath the west side of Pandim, through dwarf azaleas and rhododendrons in Zamathang. We take a foothold onto the Onglakhing glacier and climb up to the shores of Samity Lake, reputed to be the sacred soured of the Prek Chu river ringed by prayer flags, the lake reflects Forked Peak, Kabru North Gocha Peak and other snow capped peaks. Day 09: Samity Lake/Goche- La (4940 meters). Thansing, in 7 hrs. We have to leave quite early this morning, as fog and clouds come to stick to the pass shortly after the sunrise. The track to Goche-La climbs steeply through moraines. From the pass ringed with colourful prayer flags, we can see the Kanzhendzonga and beyond the Talung Glacier. Day 10: Goche-la to Samity Lake. O/N tent or trekker’s hut. Day 11: Samity to Thansing. O/N tent or trekker’s hut. Day 12: Thansing to Dzongri. O/N tent or trekker’s hut. Day 13: Dzongri to Tshoka. O/N tent or trekker’s hut. Day 14: Tshoka to Yuksom. O/N Hotel. Day 15: Yuksom to Gangtok the capital of Sikkim. O/N Hotel.